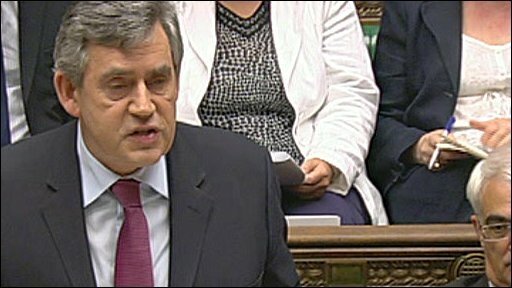 Gordon Brown has set out his policy plans for the next year, including a move to let councils give local people more priority on housing waiting lists. The programme also includes plans to cut benefits of the young unemployed who refuse a job or training offer. He said his proposals, seen by some as an early election manifesto, would "drive growth forward". Tory leader David Cameron called it a "relaunch without a spending tag" and accused ministers of "dishonesty". His comments came after Lord Mandelson said a scheduled review of spending would not be held before an election. The policy document unveiled by Mr Brown in the House of Commons is called "Building Britain's future" although many proposals relate to England only as a result of devolution in areas such as health and education. Among pledges he told MPs investment in housing would be trebled to £2.1bn, funding 110,000 new affordable homes to rent or buy over the next two years and creating 45,000 jobs in construction. "By building new and additional homes we can also now reform social housing allocation enabling local authorities to give more priority to local people whose names have been on waiting lists for far too long," he said. Downing Street said it would mean "new flexibilities" for local authorities in response to the "perception"' that the current system is unfair. Homeless people and those in very overcrowded accommodation would remain a priority, he said, but some preference could also be given to people with local connections stuck on the waiting list for a long time. It is seen as a response to the growth in a few traditional Labour areas of BNP support but is likely to prove controversial. 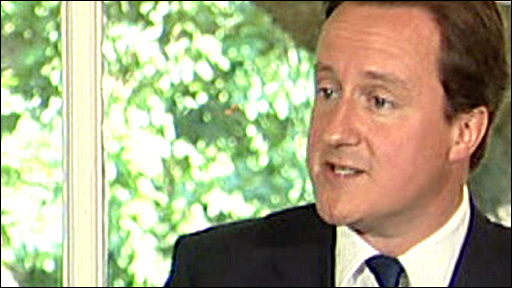 At a press conference earlier Mr Cameron warned ministers to be "very, very careful with the language that they use". He said Mr Brown's "British jobs for British workers" slogan had done "a huge amount of damage to the prime minister's credibility and helped to build up parties that none of us want to build up". Housing associations in England welcomed the increased investment but said it was a "myth" local residents were losing out to migrants when it came to council homes and the real problem was lack of new supply. Mr Brown also told MPs, from January, everyone under 25 who has been unemployed for a year would get a guaranteed job, work experience or training place - and by "next spring" would have the "obligation to accept that guaranteed offer" or face having their benefits cut. When is someone going to tell him that he's run out of money? Those who refuse a suitable job offer could lose two weeks benefit, four weeks if they turn a job down a second time and 26 weeks for a third failure. Children at state secondary schools would be guaranteed a personal tutor - and would get one-to-one catch up tuition where needed. He also confirmed plans to guarantee nobody needing to see an NHS cancer specialist would have to wait more than two weeks and ensure no-one would wait more than 18 weeks for hospital treatment. Mr Brown said the government would legislate in the next session to remove the last hereditary peers from the Lords and to allow peers to be thrown out "where there is reason to do so". Mr Brown said: "There is a real choice for our country, driving growth forward or letting the recession take its course." But Conservative leader David Cameron said many of the announcements had been rehashed and said Mr Brown had made no mention of the apparent delay in plans to part-privatise the Royal Mail. He added: "The prime minister talks about building Britain's future, but isn't it time the British people were asked whether they want him to be part of it?" He accused Mr Brown of living in a "dream world": "When is someone going to tell him that he's run out of money?" Liberal Democrat leader Nick Clegg described the programme as "a hotch potch of unrelated Whitehall schemes" with no unifying vision from a prime minister who was "running out of steam". The BBC's political editor Nick Robinson said the plans essentially amounted to the Labour Party's manifesto for the next general election. The Institute of Fiscal Studies said the policy package could be financed from existing budgets but this did not prevent opposition criticism of Labour's stance on spending. Earlier on BBC Radio 4's Today programme the Business Secretary Lord Mandelson suggested there would not be a spending review before the next general election although he later appeared to say no decision had been taken. Mr Brown was asked about it later but would only say that "no government has given more detail on spending allocations" and it was a "matter for the chancellor". The Treasury says no decision has been made. Mr Cameron said delaying the review was a "blatant attempt to cover up the truth about Labour's cuts". He said he preferred to fight the next election on "a straightforward, frank and honest platform" and warned "riots on the street" might follow if spending cuts were made after an election campaign in which politicians "pretended" they were not needed.